Vintage tabletop Jukebox with FM Radio. Just like the real thing, right out of a '50s diner! Provides quick easy access to 100 songs. Flip the pages and enter the selection code for the song of your choice. And you'll never lose a quarter in this machine! Comes bundled with our new music CD "100 Top Hits from the '50s and '60s. Includes special sound effects that simulate a real jukebox, including whirring mechanical sounds & needle drop prior to playing each song. These are fully customizable to play at Start of Each Song, at Start of First Song Only, or turned Off. 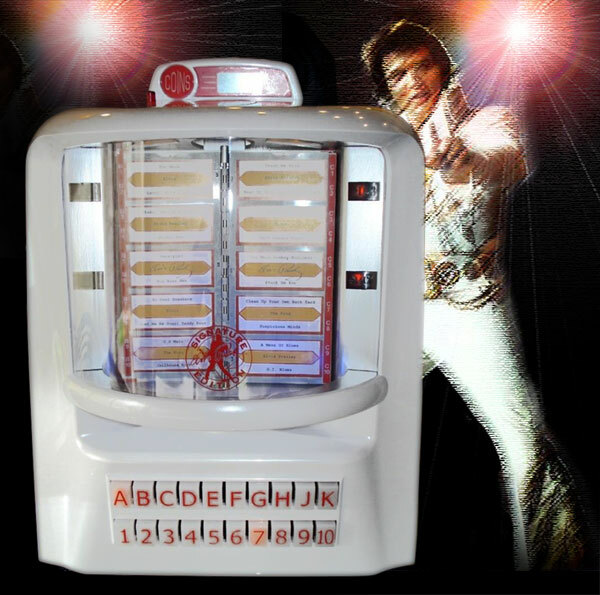 Elvis JukeBox 100 with white pearl finish, two-button song selection and song cards with flip movement exist with modern technology, like a scrolling LCD display, full-featured stereo with station presets and CD/MP3 CD capabilities. International buyers (outside of Canada and the USA) may want to add this AC to DC Power Adapter. Perfect for use with our JukeMaster Jukebox as well as CD, cassette players and many other portable devices. 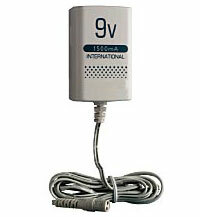 This compact adapter operates on USA 120VAC or overseas 240VAC power. (240VAC use requires foreign wall plug adapters). □	Audio Inputs - Connect your iPod or MP3 Player! All Lights, Orange Page LCD, Blue Page LCD, Orange Page, Blue Page, or Lights Off. □	Speakers: Two Full Range Speakers - Elliptical 3” x 5” - EXCELLENT Sound Quality!